Continuing our coverage of the LEGO Star Wars twentieth anniversary celebration, we are today publishing some interesting marketing material which accompanied the initial product launch. Furthermore, we have been provided with some helpful information about this unusual image of an early Millennium Falcon, predating even 7190 Millennium Falcon from 2000! LEGO Star Wars began in 1999 and its marketing campaign was initially divided between the Original Trilogy and Star Wars Episode I: The Phantom Menace. Two posters were published, featuring Darth Vader along with five sets from the Original Trilogy and Darth Maul beside another five sets from The Phantom Menace. A new danger threatens the Force...but LEGO will defeat this evil. Build and reenact the brand new Star Wars movie. Use the power of your ideas and experience the most exciting adventures in the universe. With LEGO and your imagination you are unbeatable - even by Darth Maul. Collect the LEGO Star Wars models! This artwork was created by Advance, an advertising agency based in Copenhagen which has been working with LEGO since 1976. Star Wars promotion is today organised within The LEGO Group but was originally passed to Advance as the 1999 product launch approached, hence unusual images like this one exist. Its exact purpose is not entirely apparent, although I imagine this model and packaging was designed as an example for Lucasfilm. The final rendition of 7190 Millennium Falcon loosely resembles this set, although the packaging was ultimately very different. Were you a LEGO fan in 1999 and can you remember the arrival of the Star Wars theme? Let us know in the comments. Wow, now that is one ugly Millennium Falcon. I'm glad they did a lot more work on it before releasing it. I was in high school, it really got me back into Lego. Unfortunately, I couldn't overly afford buying the new sets until I started working in college. Lego was always my favorite toy as a child, but when the ability to have licensed characters came around it really pushed it past the limit. I tell my two sons these days that no other toy will allow Yoda, the Flash, Voltron, Gandalf and Groot to go on adventure together. 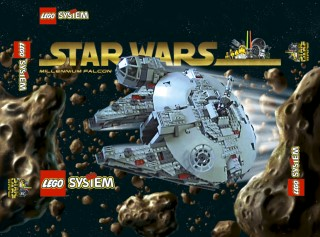 I want to say Christian Faber had an article on his blog about early Lego Star Wars design. He was employed by Advanced working on Lego Star Wars until he was moved over to working on Bionicle. Considering I wasn't even born until 2000, I was not a fan of LEGO at that time XD. However, since 2008, I have been a huge fan of Lego Star Wars, and have some of the earlier sets of the wave including the original Vulture Droid (7111), Technic Battle Droid (8001), and Bounty Hunter Pursuit (7133). It is truly amazing to see how much LEGO has done for the past 20 years. I don't remember a thing from 1999 with LEGO Star Wars, but I know I was around because I was 5. I do remember 2000 being the year I was getting into it and then for the next few years, we kept buying the Landspeeder and the AT-ST because I kept breaking them apart and not putting them back together. I also remember when my dad and I saw Jango Fett's Slave I and some of the technic figures, things we didn't even know were sets, we just had to get them while they were around. Then around 2003, we were on Ebay and eventually Bricklink grabbing up the majority of sets we missed out on from before. Still missed some, but that's how I got started with LEGO Star Wars. It wasn't until recently that I obtained the first Millennium Falcon! Even back 15 years ago, it was in the hundreds just to get one, not even necessarily with a box. I got lucky with someone that was unfortunately having to sell their collection, but I got it for about $110. And in a few days, the first X-Wing will be at my door and I'll at least have the complete first year of LEGO Star Wars. Now to try and complete 2000 and so on... I don't know how long it will take because of UCS, and that Podracer Bucket really isn't worth it, but if I could say... get a complete collection of the first 5 years of LEGO Star Wars, I'll consider that a decent achievement. I'll bask in all the old grays, browns, and yellow figures. I would love the prototype version of The Falcon to 7190. Managed to secure 7190 on eBay a few years back... ended up using the circular top / bottom of the hull as the top / bottom of my Death Star sphere. This was my full entry theme into SW to be honest, yes I bought Lego sets before or had them gifted to me by my parents this was it. iT Tie Bomber remake (just in case Lego understand it is a Tie Interceptor from the ST like they did with Resistance). Well...... first of all I feel old judging by the number of "YFOLS" Young Fans of Lego on these comments. I bought 7190 in 2000 and Star Wars Kick started my Collection, although bizarrely I didnt bother with any of the 1999 sets (I was just over "Space" dying out) I too like the marketing design better than mine. The legs were forever falling off of you moved it if memory serves me. Huw / Capn you have a mission. GET Lego to release the marketing model to celebrate the 20 year celebration. Its retro but better than early sets. I own a few sets from when the LEGO SW theme was first introduced. All bought brand new when they came out. Including the first Falcon. I was excited as I love Star Wars and LEGO. I still happen to have a #7101 sealed, though the box does have a crease from multiple moves in the last 20 years. A bit off topic, but I tried registering for the brickset forum (tried twice with 2 different emails) and I always get permission denied when I try to log in. I can't find anywhere to ask for help on the forum page. Any tips? Oh yes. I remember the launch of the SW license, the hype, the excitement, the build-up (pun intended). I remember how excited I was for this. Prior to 1999, my brother and I made our own Star Wars sets and adventures with our bricks. The theme had totally changed TLG and kids' childhood around the world. That Millennium Falcon looks like one of the UFO ships from a couple years before. Glad they redesigned. Some people talk about the time they spend between getting rid of the childhood Lego and rediscovering it as an adult as their "dark ages". I refer to the time period since then as "how come my wallet is so light ages"
As a kid in the 90s, I kept wishing Lego would make Star Wars sets (I'm sure I wasn't the only one). I would always make my own out of random color blocks and making makeshift lightsabers using the yellow/clear pirate drinking cups with a tube in them. Fun times where you're forced to improvise with the little parts you had. It wasn't until I was in high school where they started making Star Wars sets. I was excited to finally see them, but at that point, I moved on from Legos and was preparing for college (a.k.a. being super frugal). I wished they could have came out earlier so I could enjoy them. However, I kept up with Star Wars Lego over the years in college and kept looking at pics on the internet. Finally, after graduating and working a stable job, I'm able to start collecting some of them now. And seeing that they update sets over the years, I usually get better looking ones such as the newer Falcon, so that's also a plus. Speaking of that Falcon. I remember the first time I saw that set thinking "Wow, they're finally making that big thing. And I know they need to improvise parts, but geez, that cockpit...." And wow, that front middle section of the prototype is REALLY tall. The cockpit reminds me of Rock Raiders but shorter. 1999 was actually the year my dark ages began, but I still managed to get 7110 Landspeeder which now sits side by side with 75173. The Landspeeder was actually one of my first ever Lego sets, and the Vulture droid was the first I bought with my own money. Some good memories for me, I'd say. 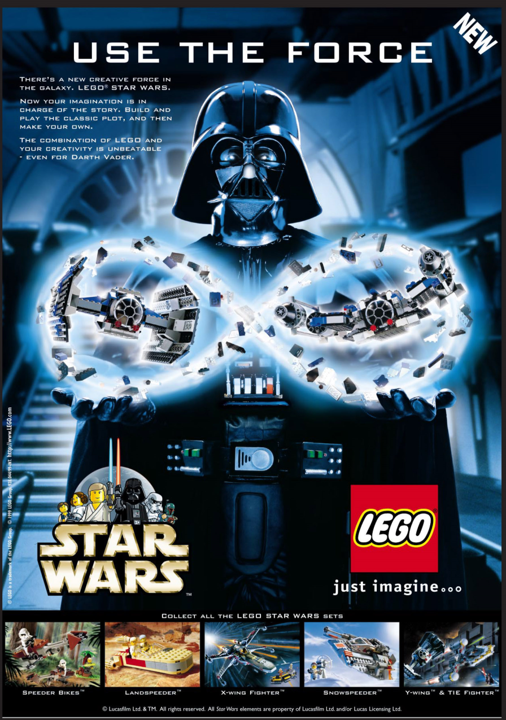 All these articles for the 20th Anniversary of Lego Star Wars are cool, but somehow I expected this one to be a little longer or more detailed. Anyway, I was 10 years old in 1999, and the perfect age for the effect of LEGO Star Wars to hit me like a pile driver. I had only become a Star Wars fan the year before, so marrying it to LEGO, my obsession of the last five years, was an amazing move. I don't remember much of the promotional material for the original trilogy sets; suddenly, there they were in the January 1999 [email protected] catalog! I was flabbergasted and overjoyed. I was more wrapped up in the pre-release fever for the Phantom Menace Lego sets! In the months before the April launch, the Lego website had a "secret" page with all these jumbled puzzle pieces. My dad showed it to me, and I managed to put the puzzle together to reveal the Naboo Starfigther set! That hooked me; I had to have that set! The only downside to all this was that April and May were not the usual times for me to receive Lego gifts. I got lucky one day in April when during a regularly-scheduled visit to Target, my eyes fell upon a display rack full of the "Lightsaber Duel" sets featuring Darth Maul and Qui-Gon Jinn. My parents took pity on me after seeing how cheap it was and bought it for me. This was my first Star Wars set! What an experience it was to hold those chrome lightsabers! I remember awed by the capes and Qui-Gon's hairpiece, not to mention Darth Maul's hood. Not knowing anything about the movie, I spent many hours having Maul duel Qui Gon whilst clinging to his speeder bike. Later, in May and after I saw the Phantom Menace, my good grades allowed me to pick up significantly more Episode I swag, including that Naboo Starfighter. I loved it so much I took it on a family trip to Bolivia that summer. I'm amazed I didn't lose any pieces flying it around the balconies of my grandmother's home! Episode I nearly made me forget about the original trilogy for a while. For my birthday, I got the Mos Espa Podrace, and that became the new crown jewel of my collection for a while. But by Christmastime, I remembered the original trilogy sets. Several of these were starting to go on sale, and I think that is how I got the X-Wing Starfighter almost a year after initial release. I think I loved that one even more than the Naboo Starfighter. And so, my Lego Star Wars collection was born. As you can see, Star Wars dominated my Lego collecting in 1999. That would continue in 2000 and almost most of 2001, when I started feeling my overall interest in Lego was starting to wane. But in 2021, we'll be celebrating the 20th anniversary of the theme that not only saved my love of Lego, but even Lego itself! I was 11 years old in '99 and I remember being so psyched for LEGO Star Wars! I vaguely recall the posters with Vader and Maul as well. 1999 was the year I got my bachelors in mathematics and I celebrated by buying the Lego Snowspeeder. My dark ages started in the 80’s and the combination of two of my favourite things (Lego + Star Wars) should have been enough to end those dark ages, but it didn’t, mainly due to lack of money. '99 was probably the last time I stepped into a Toys R Us in the UK during my dark ages. I completely missed the Lego launches but vividly remember all the episode I toys lining the shelves. After building Star Wars ships long before the 1999 releases I could not resist buying the 1999 sets. I own almost all of them. And I still buy some sets today. The LEGO Star Wars sets brought me out of my Dark Ages. Joined LUGNET and my purchases included Landspeeder first and eventually everything from the first couple years of Star Wars. The pride came from the UCS X Wing and UCS TIE kicking off the UCS. From then on I focused only on larger sets. I also snapped up 3450 Statue of Liberty at the time. My previous LEGO sets before dark ages ended with early Pirates sets 1988-1989 and Model Team through Whirl N Wheel Truck (1990). Interestingly, today I am not really into the Star Wars sets as much. I lost interest and only pick up the occasional UCS set. Instead I spend all my LEGO money on the Creator Expert sets every year. I bought my first house in 2002 and displayed 7190 proudly with others for a while before taking them down and selling them off years later. I’m so old, none of that stuff feels like that long ago. Throughout my youth I had built Millennium Falcons, X-wings and At-At's out of an assortment of Town and Space sets. Then my dark ages came. I had dabble on Lugnet and looked at some old instructions on Brickshelf but hadn't bought anything new in years. While Christmas shopping in 1999 I saw set 7140: X-wing Fighter on a store shelf. I was surrounded by my peers and without hesitation or pause , I gleefully purchased that X-wing and reveled in building it that night. It relaunched my love of LEGO and I've kept collecting ever since. Yup! My son was just old enough to start building. So he and I tackled many of the early sets together. We still have them. I can remember the arrival of Lego Star Wars. In fact it was the arrival of the Star Wars theme that brought me out of dark ages. One thing I distinctly remember is planning to buy all of the sets, only to realize that the original 7131 Anakin's Podracer set was duplicated in its entirety within the 7171 Mos Espa Podrace, so I skipped it. The first of _many_ sets that I would end up passing on, or just missing out on, over the years. I remember being very excited for it at the time. I was 25, just married to a beautiful woman who didn't share, but understood (and still does) my love of Star Wars. (Lucas's Star Wars, not today's Disney stuff.) We didn't have kids yet so I was able to buy more LEGO for myself then! I was thrilled with all the new additions to the SW universe that Lucas had made, and the next six years were among the best in my life - not only did we get a brand new trilogy of films from the master storyteller himself, but brand new LEGO inspired by the greatest space fantasy ever told. Meanwhile my wife and I welcomed our two sons into our lives, and I started a new career as a teacher, and haven't looked back. It's been a long time since I have bought any LEGO Star Wars, primarily because the Disney material is not to my liking. These days I tend to focus on City and Marvel. But I'll always have the LEGO from those halcyon days, and the memory of seeing three brand new adventures for the first time. LEGO Star Wars is what got me back into LEGO! I’d been kind of keeping track of LEGO by wandering through Toys R Us every so often, and I was NOT impressed by the late 90s sets. Excessive Juniorization, absurd prices, and low availability were the exact opposite of the heyday of the 1980s. But then sometime in 1999 I walked in to buy a birthday present for my nephew, and decided to wander over to check on LEGO, and I saw that X-Wing. It’s hard to describe the feeling I had seeing that set. Sure, by today’s standards it’s a little weak, but at that moment in time it was a revelation! It kicked off a collecting hobby that, some four years later turned into a MOCing hobby, and I’ve been hooked ever since. If it weren’t for Star Wars LEGO, I seriously doubt I would’ve returned to the hobby before I had children. I was in the middle of the deepness of my dark ages in a country where LEGO barely can be purchased. I remember getting my first issue of Lego Magazine in the mail and took it out to see Star Wars was on the cover, which at the time was my other passion as an 8 year old so it made my entire summer knowing those sets were coming. We couldn't afford much, but of those originals, I got Luke's Landspeeder and Anakin's Podracer and I spent many an afternoon playing with those. Seems like a lot of people or unimpressed with them, but at the time, it was the greatest toy to grace my childhood and I'll treasure those sets for a long time. If you go to the http://lego.brickinstructions.com/en/lego_instructions/theme/lego_star_wars/11 you can find the sw 99 instructions for the old sets. I use it to bulid them just dont have the stickers but still come out ok . It brought me out of my dark age, when my wife bought me the Gungan Sub for a birthday present! Never saw that Phantom Menace poster... Darth Maul there side-eyeing the alternate model build like he expects it to explode in his hand or something xD But I remember Lego World Club magazine one month came with a postcard-sized version of the Darth Vader one, and I thought it looked so cool, ha. I still have a nostalgic fondness for it even now. 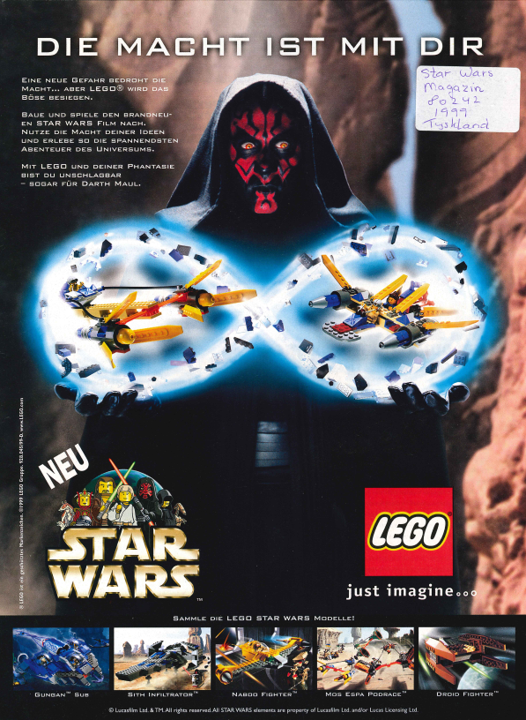 I remember the original launch mostly because of the two double-page spreads of the Phantom Menace sets in Lego Adventures magazine in summer '99... I must have been seven at the time, so was the perfect age for them. I knew nothing about Star Wars at all, but the aesthetic of those pages was so cool that it completely drew me in... I got my first set, 7121 Naboo Swamp, without having a clue what was going on or who the characters were, I was just that fascinated by that aesthetic. The biggest one of the original sets I had was the Mos Espa Podrace... got it for my birthday a couple of years later, in 2001, when it had been on sale. Oh, sure, the set had its limitations - they were a bit flimsy, and those sand-coloured beams holding the otherwise loose parts of the podracers together were certainly a bit of an eyesore! - but there was nothing quite so satisfying back then as building Sebulba's engines out of so many tiny little bricks and seeing them take shape so effectively using barely any new specialised parts. Stick me in the camp of support for that Falcon over the released one. Besides the weird thing in the front between the cargo holds this looks much better detailed than the 2000 one. -Has been an awakening... have you felt it? It was ME, RISING from the dark ages! These sets ended my dark ages and I was fascinated about all the new colors like tan, dark grey or brown ... not so much about the Star Wars factor. But perfect for a MOC builder. I also liked (and still like) the flex hoses which came in black with the Pod Racers and and even blue with the Gungan Sub. Congrats to LEGO for such a well anticipated theme! Without this success many other cool stuff like modular houses would never have happened. My little brother an me managed to collect the full 1999 release program. We were 9 and 16 by the time. Yeah, it consumed a lot of pocket money and birthday/christmas wishes, but I believe it wouldn't be possible by today's pricing policy =/.